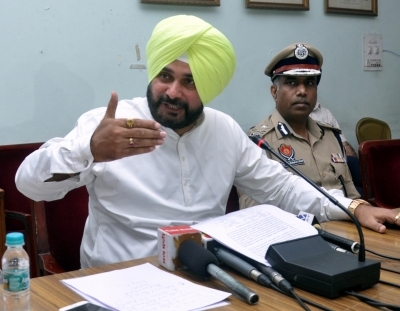 Terming it as one of the biggest scams to have hit Amritsar, Punjab Local Government Minister Navjot Singh Sidhu on Sunday said that seven officials of the Amritsar Improvement Trust are under the scanner following the unearthing of a scam involving siphoning of approximately Rs 80 crore. Sidhu told media here that the probe in the matter has been handed over to the Amritsar police after a departmental enquiry. “The initial probe got underway from the three bank accounts in which there was an inkling of a scam to the tune of Rs 2-3 crore, whereas on being probed by the departmental officers, the net has widened to 70 bank accounts and now there is possibility of the siphoning of approximately Rs 80 crore. And it is still growing,” he said. He said that the departmental officials allegedly involved in the scam transferred money out of the governmental accounts in the name of their relatives and the scam remained under wraps for want of any departmental audit. Divulging more, Sidhu said that on the basis of the probe headed by the department’s Chief Vigilance Officer Sudip Singh Manak, police has registered a case against Amritsar Improvement Trust officials Arvind Sharma, D.C. Garg, Paramjit Singh, Daman Bhalla, Tina Vohra, Chartered Accountant Sanjay Kapoor and Satnam Singh. “The money has been withdrawn by issuing 49 cheques under the signatures of Sharma, 2 cheques under Garg’s signatures and 3 cheques signed by Paramjit Singh. The minister added that all the alleged wrongdoers would be suspended and chargesheeted. Sidhu said that the department CA never cared to probe the scam inspite of the fact that the government auditor raised 631 objections on the works carried out by these people. “This might be the biggest improvement trust scam till date in which such gross loot of the public money has been indulged in,” he said, adding that to put a stop to such scams in future, third party audit of all the trusts would be carried out mandatorily.